Yes, coffee! Coffee, coffee, coffeeeee! it up to you, though Sounds like you've had too much already, mate. 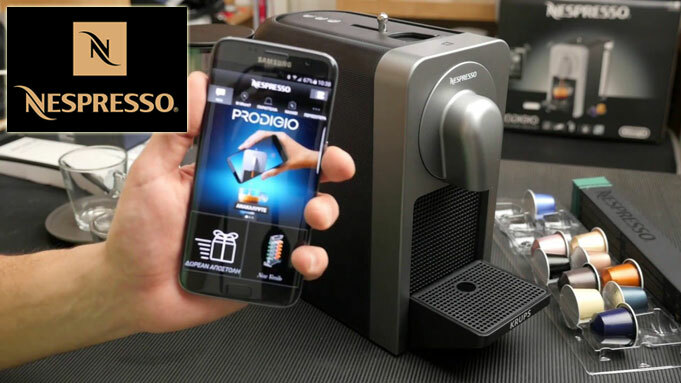 But yes, this is a Nespresso Prodigio coffee machine; the first Bluetooth-enabled Nespresso machine. It's sleek, durable and fitted with a 19-bar pressure pump. 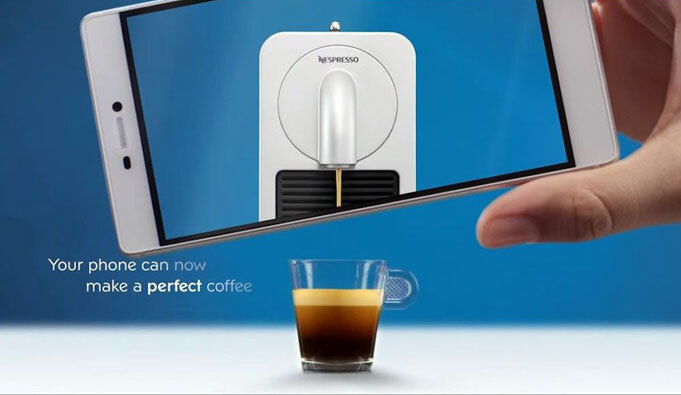 When used with the Nespresso smartphone app (Android, iOS), it'll whip up your favourite drink while keeping an eye on your capsule stock. Good, because I'm always running out. Considering the amount you clearly put away, we're not surprised. When the machine is paired with the Nespresso app, each time you use a capsule it'll update your stock levels, giving you a read-out of how many precious capsules you have left. It's a nice-looking machine. Agreed. The Prodigio can be bought on its own, or for an extra $40 you can buy the Prodiaio&Milk - the machine plus an Aeroccino3 milk frother. The Al Barista has a descaling alarm so you know when to, um, descale it, and a 25-second heat-up function and comes with a rotating water tank for easy placement in the kitchen. I'm lazy, can I "order" a coffee from my bed? YES! 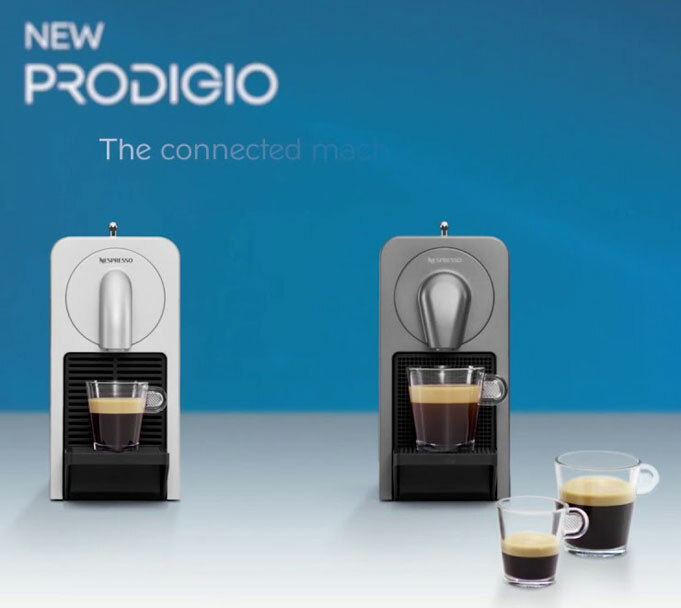 Via the app, and assuming that earlier you placed a capsule in the machine and then set a cup beneath the spout, you can program the Prodigio to make your favorite coffee at a set time. Select the size of the coffee you want - there are three sizes to choose from - and press 'schedule brew'. Sweet! When can I fuel up? Both the Nespresso Prodigio and Prodigio&Milk are available now, so fill your boots... Or should that be a cup? The coffee machine weighs 7 lbs, with a size of 25.5 (H) X 37.4 (L). The pressure guarantee by the Prodigio coffee machine is 19 bar. It only takes 25 seconds to heat the water ready for use. The Proigio coffee machine comes in two color options - titan or silver. Using the Nespresso smart phone app, you can laze in bed and brew any of the 23 Nespresso Grand Cru Coffees with your Prodigio coffee maker. You'll still need a servant to bring it up to you though! The Nespresso App also trakes yous capsule stock, displaying how many coffee capsules you have left. When you're running low, simply push a button on the app to place a new order.